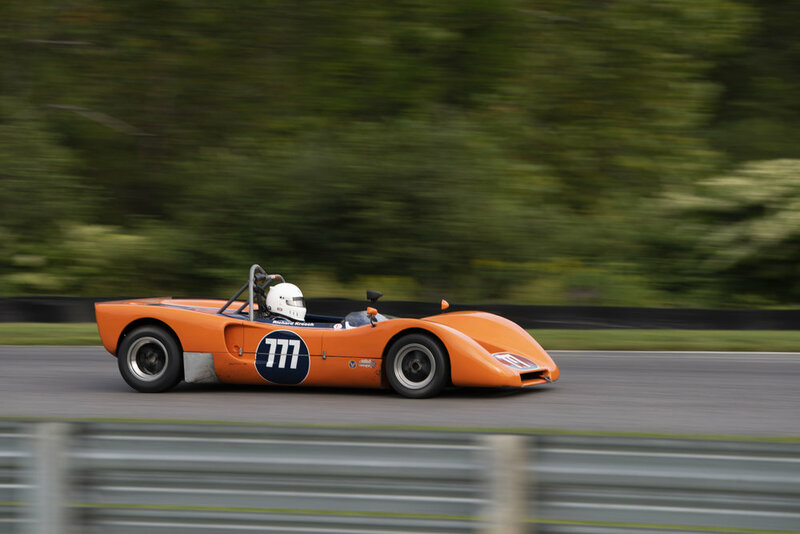 Lime Rock Historic Festival 36 — Automotive Restorations, Inc. In racing, there isn't an event, race, or single lap without a story to tell. 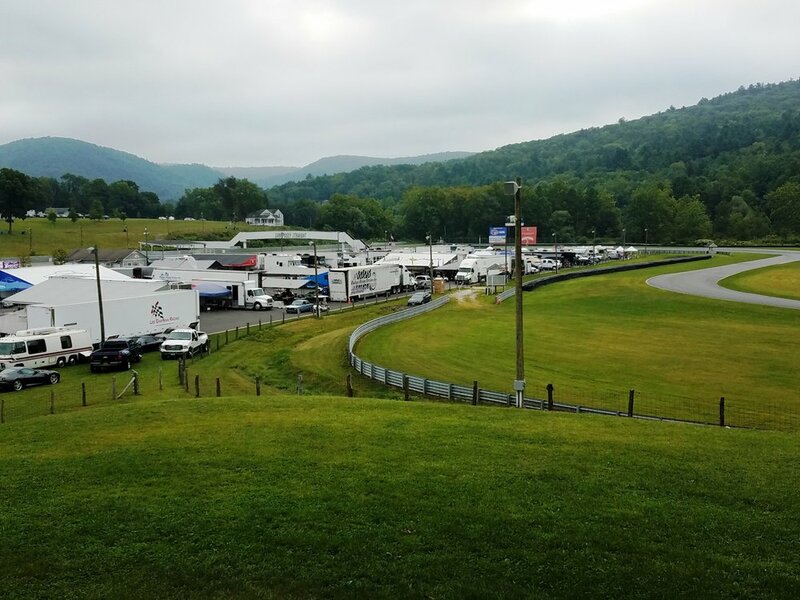 Here is a collection of our trackside stories. 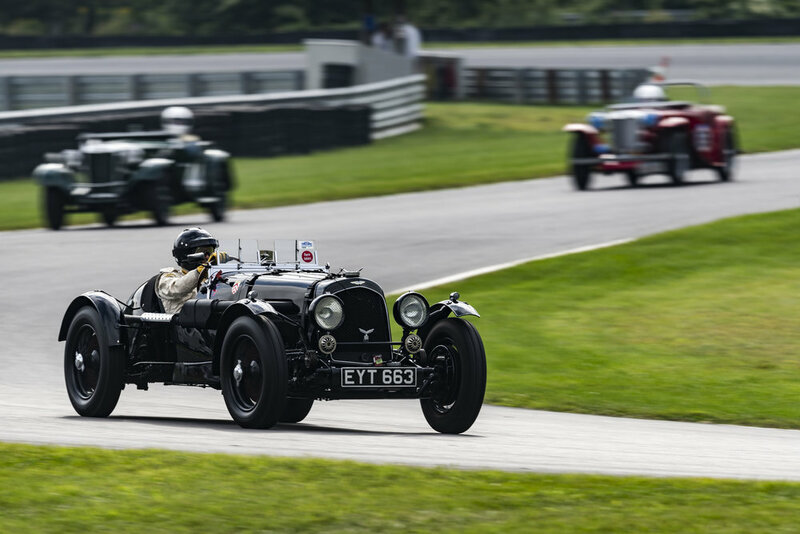 A Highlight of the Vintage Racing Services 2018 season comes to life at speed! Good times for all abound. Rob did indeed have his hands full…of 2 liter Aston Martin that is as he prepares to turn into the left hander above and applies some body English right to assist in turn weight transfer. Rob and Aston performed well all weekend with nary a wheel out of place. Reliable in the extreme and the VRS crew was suitably well rested by lack of trouble in all of Rob’s runs!! Pals Scott Rodgers in 69 Mustang and Alex Heckert in his smokin’ 66 Corvette chased each other around awhile with Alex pushing ahead after a few laps. Corvettes really should be a bit quicker than even a Boss 302 Mustang. 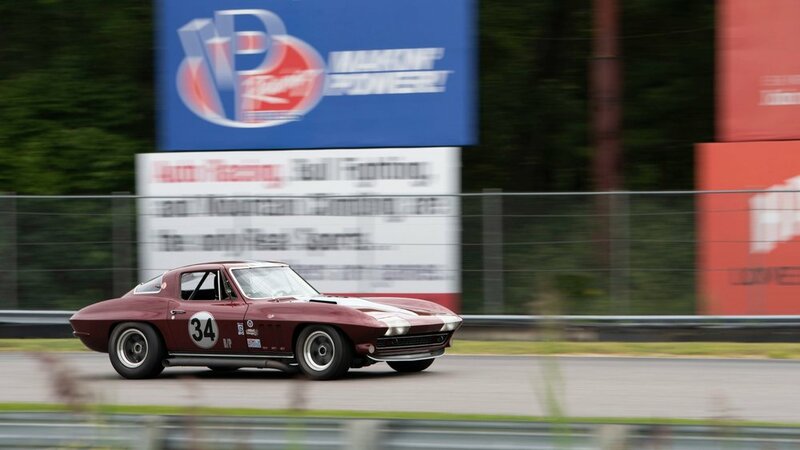 Scott’s example has quite a history having competed in the European Trans Am Series in it’s former race life. Both finished well and sunny side up! 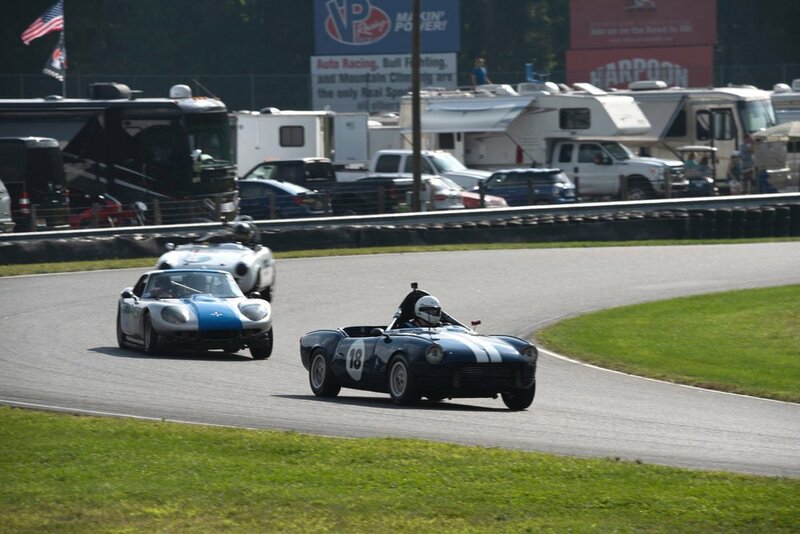 A SPORTS 2000 STORY: Jim Montana in his Lola T598 lead the way all weekend long in the VRS S2 parade. 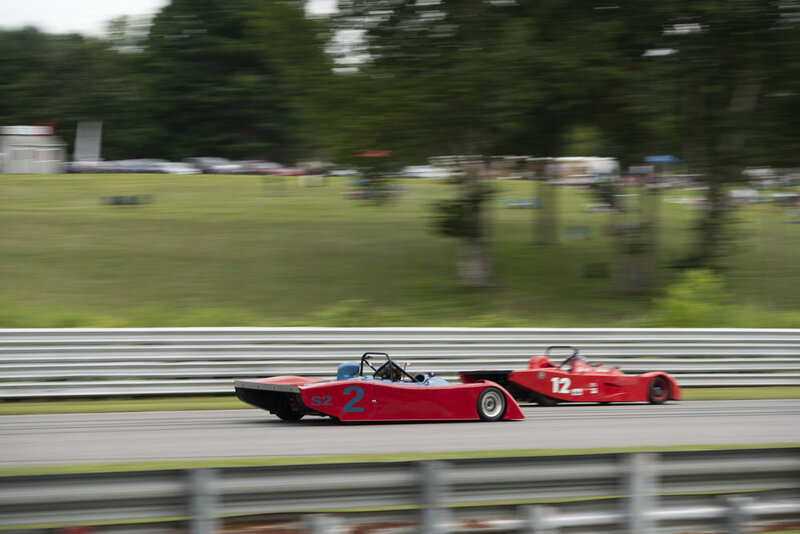 Bob Mittman and Carbir and Mark Starr in his Lola pushed ahead consistently, stayed on track and at speed but just could not catch that Movin’ Man Montana. No mishaps, and respectable performances all around keeping the VRS technicians at peace and happy. Well done guys!! Results: Dave Gussack qualified on the pole with VRS’s Kent Bain just behind. Bain could not make it stick come race time but Dave did as the hat above attests. Brown and Gosselin ran well all weekend long finishing ahead of some higher power machinery. 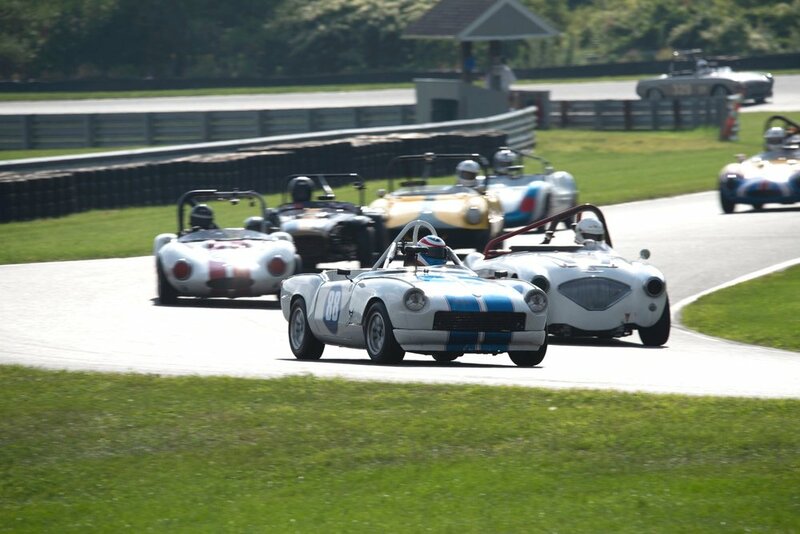 In Kent’s Domain race group: Ed Mettelman’s Porsche 914-4 2 liter machine did not miss a beat … but Ed did; chalking up one spin to finding the limits. Ed stayed on track for a solid performance once the limits were properly tested. Below, Richard Kresch and his Beach-Abarth 850cc were “as one” and QUICK finishing 7th OA in one race among some much more powerful machines. Richard and Royale-Lotus RP4 on route to another checker. Neither Richard nor his Royale found anything amiss all weekend and both enjoyed the ride!! The VRS Crew had it all handled: Tim, Glenn, James, Chris, Oliver Linda, and Molly along with engine man Jim Coleman did their part to keep the speed up and the smiles coming session after session. Good Job all! VRS Chief tech Glenn Taylor not only kept several of the VRS racers running just right, he took to the track in Group 8 winning several races in his 1979 PRS Formula Ford. When you’re that good, you do of course garner a Fan Club; photo right!! !